Central banks in Europe, the United States, the UK and Japan follow different policies – at least to a point. But they share one important trait: a deep reluctance to change course. On Thursday, the European Central Bank again refused to respond to signs of deflation with any serious stimulus. On the same day, the Bank of England also did nothing, ignoring evidence of housing market froth and solid economic growth. On Wednesday, Janet Yellen, who chairs the U.S. Federal Reserve, found a new reason – the relatively weak housing market – not to accelerate the slow tightening of monetary policy. Meanwhile, the Bank of Japan is determined to keep its policy stimulative enough to overwhelm any possible slowdown in demand from a higher rate of sales tax. The bias towards continuity may be partly unconscious. However, monetary authorities can present a good, if somewhat embarrassing, economic argument. The current mix of financial, economic, political and monetary conditions is so fragile that the slightest change could wreak havoc. And no one really understands how one ingredient influences another. The financial crisis and subsequent deep recession discredited the central banking profession’s last simplistic model. Before then, central bankers talked about a “reaction function” by which a certain change in unemployment or inflation rates would neatly produce a given, and appropriate, shift in policy. In reality, monetary policy is more of a balancing act than a mechanical process. All central bankers are worried that the still recovering financial system could buckle if interest rates or monetary policy shift too quickly. Rising valuations for financial assets make everyone nervous, except in Japan, where falling prices are more worrying. The ECB also has to worry about nationalist German politicians and irrational sovereign debt traders. The Fed, aside from having promised that it won’t tighten policy with any haste at all, has a terrible system of housing finance to consider. For its part, the BoE knows that a housing bust could cause a recession. Perhaps central bankers would be more daring if they had a model they truly believed in. But they are like hikers lost in a forest at night. While waiting for dawn, it’s usually best to stay put. 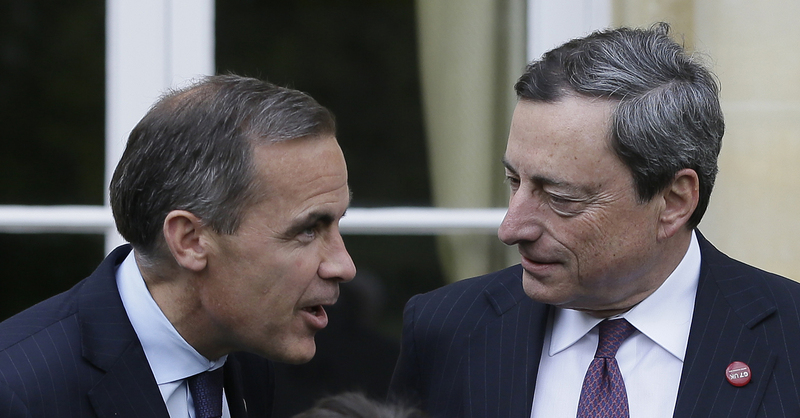 The European Central Bank left its policy unchanged at its meeting on May 8. “The Governing Council is comfortable with acting next time but before we want to see the staff projections that will come out in early June,” Mario Draghi, the central bank’s president, told a news conference after the decision was announced. The Bank of England did not change its policy at its meeting on May 8. No statement was released. A slumping housing market and geopolitical tensions risk undermining the U.S. economy and bear close watching by the Federal Reserve, Janet Yellen told the Joint Economic Committee of the U.S. Congress on May 7.